JROTC cadets and their guests eat dinner. Gowns and Class A jackets swirled around the dance floor at the 53rd annual Military Ball, which was held on Jan. 12 at the Fort Sam Houston Community Center. 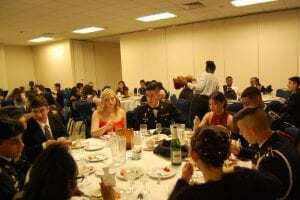 The ball, consisting of a formal and nonformal part, included a ceremonial toast to fallen service members, dinner, and a speech given by guest speaker Mills Rodgers; retired NCO and mental health specialist as well as Roosevelt’s Achieve teacher. After dinner, the informal part of the ball began, bringing the Battalion together as they celebrated the class of 2019, presented the sweetheart and beaus and danced. Battalion Sweetheart and Beau, Senior Joel Lopez and Junior Katya Rodriguez have the first dance. For many cadets, this was a bittersweet experience because it was their last Military Ball.